Wood burning camping stoves usually don’t produce a lot of exciting news. However, a reader recently submitted a new piece of gear I had to share. Exquisite form meets exceptional functionality in the Emberlit Stove ($35 Steel – $55 Titanium). Powered by wood or other biomass readily available, the Emberlit camping/backpacking stove is a big improvement over traditional folding stoves of this type. What makes it so special is the fuel port on one side. Most other stoves of this type have no way to easily feed fuel once the fire is lit and is being cooked causing a “yoyo effect” on cooking temperature. Not to mention the irritation of having to remove your pot form the top to add fuel. There is even a heart warming story attached to the stove. The Emberlit Stove may look like it was designed by one of the big camping companies, but it’s actually a small business owner who hopes, “To just make enough money so his wife does not have to work at Walmart anymore.” After speaking with the inventor/owner/operator Mikhail, I get the since that this is someone who really has his heart in his company and his product. What sets this stove apart from others is its ease of use. 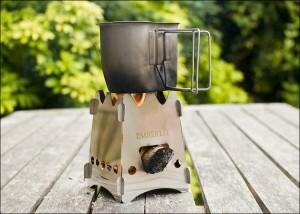 Properly fed, the Emberlit Stove requires minimal effort to produce and maintain an even flame with little or no smoke. This means that instead of fidgeting with the stove you can focus on cooking. Since the Emberlit makes much more efficient use of fuel than an open camp fire, a couple handfulls of twigs and sticks gathered on the trail is more than enough to boil water and cook a full meal. Thanks for the gear lead Norris. We just got our steel Amberlit yesterday in the mail. We put it together and fired it up with a small ball of dryer lint and our peanut lighter (another great gadget). It only took a few twigs and pine needles to boil a whole pot of ice in a few minutes. It was amazing and easy. However, the edges of the plates are very sharp since they are punched out. Yes, I cut my finger assembling it. So before you attempt assembly, you may want to take a file or sandpaper and round the edges and prevent an inadvertant blood sacrifice. Could you not achieve the same thing from using a coffee can, one that is not plastic. For some reason I thing you could jury-rig an outfit at less the cost and possibly a size more accomodating to the individual? What you are referring to is a Hobo Stove, Tom. Yeah, they work and cost next to nothing to build. However, this stove breaks down flat–Hobo Stove can’t do that. The Emberlit stove can easily fit in most EDC bags and be carried around everyday–if desired. It would be difficult to do that with a Hobo Stove made out of a can.